Member Group or Affiliate Group? Views differ on this amongst our members. Click on the link below to read some of the arguments that will be presented at the AGM, and do feel free to start discussing the matter on the Forum prior to the meeting. I draw a parallel with the Ramblers Association, which like the CTC/Cycling UK is a charity and a members organisation. The Ramblers started out as a federation of rambling clubs but made the change to a national organisation in 1935. For many years, there were no local groups. These only started to be set up in the 1960’s. There are some tensions between the elected trustees, officers & members but on a lot smaller scale than in the CTC. Members are & will be a great asset to Cycling UK/CTC. The way the Council have organised the recent elections has been very poor. We should try to change that, but we shouldn’t leave what is OUR organisation. I like your comments Keith, hope to see you on Saturday. I personally wish to remain a member of cycling UK. It is a worthwhile charity that I will continue to support. However I understand that some people feel so anti cyclingUK that they will only continue to cycle with us if we become affiliated, so I would support affiliation. I’m assuming that if the club decides to affiliate it will not change anything for those of us who wish to stay with cycling UK. Would the postal codes currently served by West Surrey be shared around neighbouring groups? Bob, it would be rather amusing if the area in which CUK had its HQ didn’t actually contain a member group. My personal view is that CUK are not unduly worried about whether or not they have member groups or not, so it wouldn’t bother them overmuch. I don’t reckon they’d even bother to divvy out the postal codes to other member groups. Indeed there are other areas of the UK which don’t have a member group and West Surrey would just become one such area. And of course, if three members living in the area wanted to start up a new member group, they could do so, provided they were willing to act as Chairman, Secretary and Treasurer of the new member group. 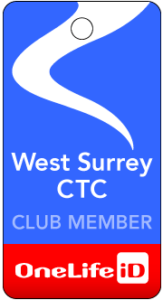 I can confirm that if WSCTC were to become an affiliated group, there would be no change in an individual’s membership status or insurance cover were he / she to remain as a member of Cycling UK. This is perhaps the most significant fact that members need to appreciate. For info, the equivalent French club – the FFCT – doesn’t have member groups but instead is organised into regions to which cycling clubs become affiliated. As such they are a huge organisation with vast numbers of affiliated clubs. FFCT of course have individual member just like CUK. A significant difference is that their members can opt to receive a magazine or not and pay accordingly. Thanks for the clarification Mark. I’m hoping for a result on Saturday that will make both camps happy. I wish to remain a member of Cycling UK – partly for insurance and partly to assist in the general promotion of cycling. I therefore see downsides as explained in your background notes if we moved to an affiliated club. From a personal point of view I see no benefit of also being a member of another affiliated club. I would prefer that those who are unhappy seek to change the organisation from within rather than electing the ejector seat option. My view, for what it is worth is that we should remain as we are. I dislike the way the management are behaving, but still feel we are better off inside (bit like the EU perhaps?). Taking into account the insurance and finance issues it seems to me the downside risks outweigh the benefits.